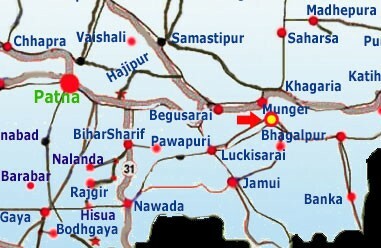 Munger district has a unique historical background. The areas falling under this district are considered a part of the first Aryan settlers’ midland. It has been identified with Modagiri, a place mentioned in the epic Mahabharat. It was the capital of a kingdom in eastern India near Bhanga and Tamralipta. There is also a mention of Modagiri in the ‘Digvijay Parva’ of the Mahabharata, which seems to be the same as Modagiri. The first authentic historical account of the district finds a mention in the memoirs of Xuanzang who visited a part of this district towards the close of the first half of the seventh century AD. A copper plate known as the ‘Munger Plate’ was discovered in Munger way back in 1780. Mir Kasim conquered Munger and made it his capital till the army of East India Company captured Munger. MirKasim had to flee through a tunnel made along the bank of river Ganga near Kastharni Ghat. It is located within the Ganga Darshan Complex in Munger on a powerful energy centre, about 172 km from Patna. It is on the top of the hill overlooking the river Ganga. It was Swami Shivanand who first had the vision of a yoga university when he established the Yoga Vedanta Forest Academy in Rishikesh. Paramhansa Satyanand, who established the Ganga Darshan Complex in Munger, carried his inspiration forward. He has founded and established the Bihar Yoga Bharati, the yoga university, to preserve and regenerate yogic science. The university imparts comprehensive yogic education and offers MA, MPhil, PhD and DLitt. The most important of the monuments at Munger is the ancient fort, built on a rocky eminence projecting into the river Ganges that protects it from west and partly from the north, the other sides being defended by a deep moat. The rampart was provided with four gateways, one on each side, and with circular or octagonal bastions, at regular intervals, carrying the usual battlements. of the gates only the northern gate, called Lal Darwaza, is somewhat preserved, with some carved stones built into it, which originally belonged to some Hindu or Buddhist structure. Inside the deep Kharagpur forest, 50 km away from the district HQ, there’s this scenic spot with a natural waterfall surrounded by hills from three sides. It’s a historic fort, similar to the Red Fort of Delhi and Agra. It has original bricks and ancientstructurebut it is bereft of its original tower clock which got dismantled during the 1934 earthquake. It’s a small temple situated in the cave of a hillock on the northern flank of river Ganga, three km from the district HQ. A large number of devotees worship the eyeball that is fitted inside the temple and revere it as the eye of goddess Parvati. legend has it that this is the site where one of the eyes of Goddedss Parvati fell while her body was being carried by lord Shiva on his shoulder. Astrologers and tantriks from across the country gather here during Navaratra in September-October every year for meditation. It is believed that the maximum number of freedom fighters who laid their lives during the 1942 movement belonged to Munger. Several young boys were killed at Tarapur by the Tommies while they were hoisting the Tricolour. There’s a Shaheed Bag inside the fort premises to commemorate the historic event. The body of an ancient Sufi fakir is believed to be buried on a hillock on the southern gate of Munger Fort. This place has been renovated and a magnificent mosque has come up there. It is known as Peer Napha Saheb’s mosque. Hundreds of persons pay their respect at this mosque, especially on Fridays. The fair is held at Sita Kund every year for a month, beginning on the Maaghi Purnima day. This fair is famous for sale of wooden furniture of all varieties at affordable prices. Traders from Katihar, Purnia and Saharsa in Bihar and UP and Assam participate in the fair along with their products. It is an important fair. Elephants and horses are adorned with ancient attires and costumes. lakhs of people assemble here on Maha shivaratri to watch a special play based on the mythological marriage of lord Shiva with goddess Parvati. It’s a hot water spring, the water of which cools only for an hour on the day of Maaghi Purnima. But no one knows at what time the water cools. This hot spring, six km from the district HQ, is now enclosed in a masonry reservoir and is visited by a large number of pilgrims every day, particularly during the full moon of Maagh. Connected by good roads with all Indian cities. State Tourism Corporation’s and Private Hotels, Rest houses and Dharmshalas at Munger. Light cotton in summer and woolen in winter (specially during November to January).